On An Overgrown Path: Does this new CD really represent a wave of change? Does this new CD really represent a wave of change? In January last year Universal Music ceo Max Hole did not mince his words when he told classical music what it was doing wrong. "We need to be daring and break with convention if we are to show the world that classical music is not a sleepy, stuffy genre, but a force to be reckoned with..." he proclaimed and went on to tell classical musicians they "need to ride the wave of change" and should reach out beyond the existing core audience. Later last year Universal Music's lead release for the all-important autumn season was the CD seen above. On it Gustavo Dudamel, the anointed "saviour of classical music", makes his Berlin Philharmonic debut with Also sprach Zarathustra and two other Richard Strauss tone poems. Nothing about this new release rides a wave of change. Instead the repertoire and the product presentation follow a familiar path trodden by every record label and conductor since the advent of the LP. The performances may well be exceptional; but the choice of Strauss warhorses is sleepy and stuffy, as is the packaging, which targets the supposedly moribund core audience with its visual references to a 1968 film. Just look at the CD above; can anyone detect a ripple, yet alone a wave, of change? In his sermon Max Hole told classical musicians to change the way they dress, yet the official DG promotional video for this Zarathustra has Dudamel and the Berlin band dutifully attired in tuxedos. In fact this showcase release diverges so far from the gospel according to Max that one is left wondering whether Universal Music's ceo really meant what he said, or was that Association of British Orchestras presentation simply a well-orchestrated - in more ways than one - PR exercise? If classical music really wants to change it must practise what it preaches by being daring and breaking with convention. 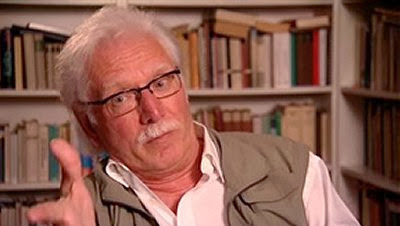 The music of German contemporary composer York Höller (seen above) is familiar to the Berlin Philharmonic, which has played it under Daniel Barenboim. At 39 minutes Höller's Sphären for large orchestra and electronics is a viable alternative which moves in a similar metaphysical world to Zarathustra. And, despite Höller being a pupil of Boulez and Stockhausen, his music is not box office poison: in an enthusiastic review Andrew Clements describes Sphären as "strikingly pictorial, often sounding like early Stravinsky, with an added veneer of electronic sounds". Instead of launching yet another Zarathustra into the market, why did Deutsche Grammophon and Dudamel not defy convention with York Höller's Sphären, while retaining the not totally inappropriate comfort couplings of Strauss' Don Juan and Till Eulenspiegel? I will not accept as an answer that Strauss sells and Höller doesn't, because the catalogue is stuffed full of superb and cheap recordings of Zarathustra; there are 248 listed on Amazon and every CD collection must already have at least one version. The received wisdom that only warhorses sell is just another of classical music's silly conventions which was disproved long ago by the runaway success of Nonesuch's 1991 recording of Henryk Górecki's totally unknown Third Symphony. 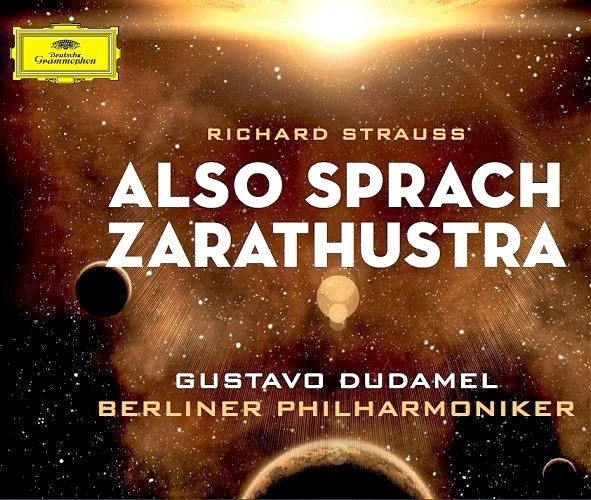 Whether we like it or not, the power of Deutsche Grammophon's PR machine is such that it is Gustavo Dudamel that sells, not Richard Strauss, and I would wager that Dudamel conducting York Höller would sell. But, despite that, we are unlikely to find York Höller and Gustavo Dudamel together on Deutsche Grammophon in the near future. So if your appetite has been wetted I heartily recommend the recording on the independent Neos label - audio samples via this link - on which Sphären is coupled with Höller's Der ewige Tag for mixed chorus, large orchestra and live electronics, a work that includes a setting of poetry from the 13th century Islamic poet Ibn Sharaf. 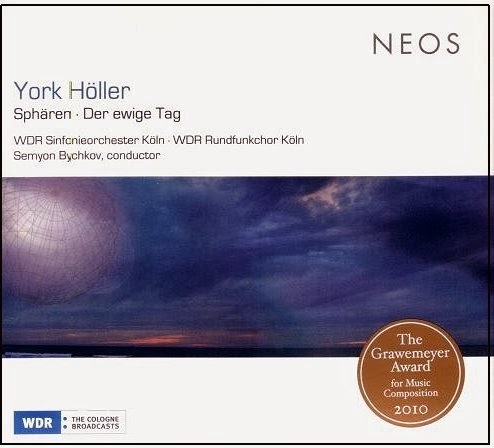 That is the CD below and on it both works are played by the WDR Sinfonieorchester Köln (with Rundfunkchor on Der ewige Tag) conducted by Semyon Bychkov. These exemplary performances and recordings prove what Dudamel's new Zarathustra singular fails to - that classical music is still a force to be reckoned with. If classical music is really serious about expanding its audience, it should stop paying lip service to riding waves of change and start putting its money where its mouth is. Classical music's big opportunity is not yet another Strauss tone poem, of which there will doubtless be very many in 2014. How many times does it have to be said that classical music's big opportunity is expanding its existing audience by opening listeners ears to new and neglected music? Also on Facebook and Twitter. No freebies involved in this post. Any copyrighted material is included as "fair use", for the purpose of study, review or critical analysis only, and will be removed at the request of copyright owner(s). I agree completely. And it doesn't help much that even Amazon.com lists the Neos recording as being "temporarily out of stock." And only two other vendors on the site have a copy of it. jmiami57, thanks for that and you raise an important point. The disturbing shift from the promise of a digitally enabled long tail of availability to the reality of a commercially driven short head of available music is the subject of a planned future post. This post should be read as gospel.